Three brothers from Marblehead won a more-than-700-mile race that began in Washington and ended in Alaska. It looks like three was the magic number. A trio of brothers from Marblehead this week took home top honors following a boat race that brought contestants on a more-than-700-mile journey across the Pacific Ocean. Trevor, Chris, and Tripp Burd, who made up Team Pure & Wild/FreeBurd, were crowned the winners of the 2017 Race to Alaska, or R2AK, on Thursday afternoon, as they arrived in port to a cheering crowd. It took the brothers four days, three hours, and five minutes to complete the excursion from Victoria, Canada, to the shores of Ketchikan, Alaska, according to the race organization’s website. Coming in first earned them a $10,000 prize. The brothers were not immediately available for comment, but a race report is expected “after they get a rest,” the team said. “Right now, they are on the back half of a well-earned sleep,” Beattie said in an e-mail to the Globe. The annual R2AK is broken up into two parts. First, contestants compete in the qualifier round, which takes them from Port Townsend, Wash., to Victoria, a 40-mile journey. For the second leg of the race, which is referred to as “To the Bitter End” and began Sunday, June 11, teams travel 710 miles from Victoria to Ketchikan. Team Burd, which, collectively, has quite the sailing resume, finished fifth in the first stage, from Port Townsend to Victoria. According to organizers, R2AK is the “first-of-its-kind,” and North America’s longest human-and-wind-powered race. Boats with motors are not allowed to race, and those trying to make it to the finish line receive no help along the way, forcing them to take on the elements and whatever Mother Nature has to offer. Team FreeBurd got its start in 2015, when two of the brothers, Chris and Tripp, competed in the first R2AK event. It took them nine days to finish, as they battled the harsh ocean conditions and heavy winds, according to Wicked Local Marblehead. This year, the team added the third brother, Trevor, to the mix. And after upgrading to a larger vessel with a cabin and three hulls, it seems the changes proved to be a winning combination. “With the third brother along, Team FreeBurd is stoked to continue to share their love for adventure,” the brothers wrote on their website, ahead of the race. 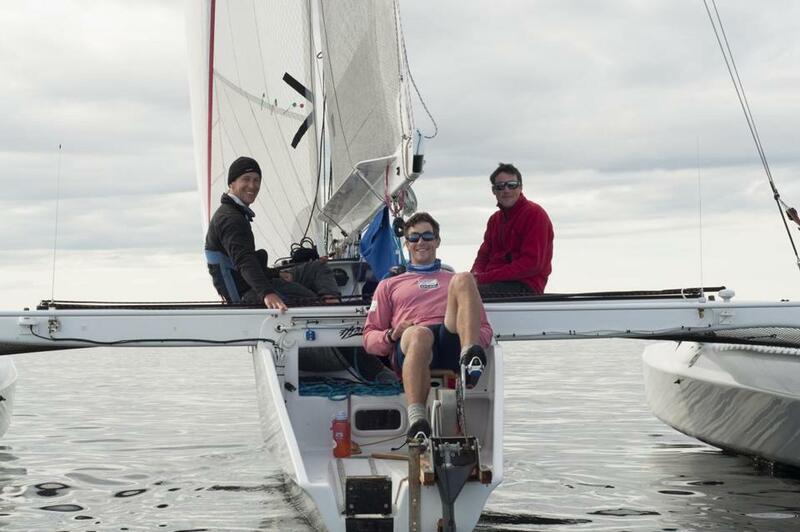 The brothers credit their easy access to the ocean in their hometown of Marblehead for helping to shape their collective passion for competitive sailing and ocean-bound excursions.